Restaurants are one of the most searched for categories within the Local Search industry, which makes perfect sense if you think about how many times you grab your phone to find a place to eat. 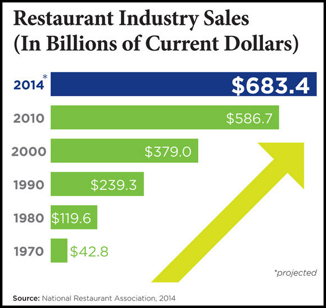 In reality, restaurants seem to be the one local industry that continues to grow undeterred by economic uncertainties. Here's a statistic that I found eye opening. almost double the amount from 2000. To answer this demand, new restaurants are jumping online and older ones are quickly realizing they need to improve their Internet presence in order to better compete, especially those up against chains and franchises. Fortunately, the common Internet marketing challenges that many of them face present clear opportunities for savvy Local Search marketers like you. There are multiple big players attempting to provide an all in one answer for the dining industry and when people are pinching pennies, some of these marketing deals seem like the answer to all their Internet needs. Many of their systems have capabilities, like online ordering, that are impossible for small eateries to develop for themselves. However, one of the disservices many of them do to small businesses is to lease them a Web site - and sometimes a domain name - on a monthly basis. Besides holding a business' Web site ransom, if one of these Web site rental companies do fail, it could easily take their entire collection of SMB's Web sites down with them.